Global Dairy Trade Price Index from New Zealand and the Factory Orders MoM from the US are the most influential fundamental reports for NZDUSD. 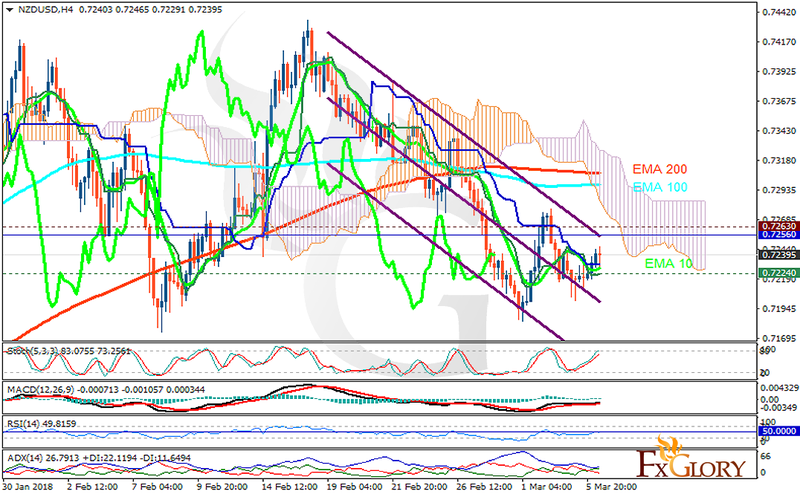 The support rests at 0.72240 with resistance at 0.72630 which the weekly pivot point at 0.72560 is located in between the lines. The EMA of 10 is moving with bearish bias in the descendant channel and it is below the EMA of 200 and the EMA of 100. The RSI is moving on the 50 level, the MACD line is above the signal line in the positive territory and the Stochastic is showing upward momentum. The ADX is showing buy signal. The price is in the Ichimoku Cloud and above the Chinkou Span. The Tenkan-sen and the Kijun-sen are both showing a horizontal trend. The resistance level breakout will smooth the way for further growth targeting 0.735, otherwise, the pair will continue its bearish trend targeting 0.719.